Imagine X-Men done with a different vibe and aimed at younger audiences and you’ll have a pretty good idea of what Push really is. Although this sounds pretty harsh, movie is actually quite entertaining, especially if you like this type of stuff, you know, people with special abilities, secret government agencies and mutating vaccines. They even opted out to give us a lot of background information on most of the characters and events in order to build a comprehensive world, but the whole thing feels really wobbly. 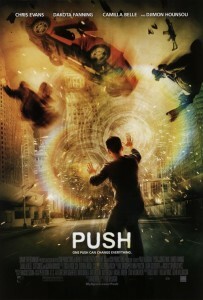 However, great special effects, camera and lack of good superhero movies, make this movie worth watching. The story is mostly set in Hong Kong, making the atmosphere much more exciting and vibrant. Hong Kong is a pretty chaotic place, so most of the filming was done guerrilla-style, with hidden cameras and actors doing their scenes in one takes. Chris Evans, who was already in 4: Rise of the Silver Surfer, Djimon Hounsou, Cliff Curtis and Dakota Fanning were all great, I mean, as much as you can be great with this material. I really didn’t like how Dakota was dressed, I mean for fucks sake the girl was fifteen at the moment of filming and for the most of the movie she’s dressed pretty scarcely. Fun Stuff: The idea of a government agency controlling people with special abilities for military and/or intelligence uses is in fact inspired by real-life experiments of the US government, particularly the long-running Stargate Project.